OUR HOPES AND DREAMS; FIGHT RACISM AND STRUGGLE AGAINST RACIAL DISCRIMINATION! On January 20,2009 a new President- An African American named Barack Obama will be inaugurated in Washington DC. To many, the dream that racism is no more is reality and the dreams of equality for all will be achieved. But not for the Filipino American community who still feel the fangs of racism at the hands the US Congress. On September 22, the US Congress House of Representatives passed the SB 1315 or the American Veterans Benefits Enhancement Bill, But they removed the whole section that pertains to Filipino World War II veterans. They excluded again the Filipinos, in a blatant act of racism in the law. The following is an article written by Al Garcia of JFAV please circulate it wildly!!!! Our Hopes and Dreams: Fight Racism and Struggle Against Racial Discrimination! On January 20,2009 a new President- An African American named Barack Obama will be inaugurated in Washington DC. To many, the dream that racism is no more is reality and the dreams of equality for all will be achieved. But not for the Filipino American community who still feel the fangs of racism at the hands the US Congress. On September 22, the US Congress House of Representatives passed the SB 1315 or the American Veterans Benefits Enhancement Bill, But they removed the whole section that pertains to Filipino World War II veterans. They excluded again the Filipinos, in a blatant act of racism in the law. For the second time, the US Congress discriminated against the Filipinos. The first time was on February 18, 1946, the 79th US Congress removed the benefits and all entitlements for 250,000 Filipino World War II veterans by stating �their military service were not deemed active�. By a stroke of a pen, the US government removed the recognition of the wartime services and the sacrifices of the Filipino nation during World War II. For 63 years, Filipino veterans suffered discrimination and racism. Of all 66 nationalities that served the American flag, only the Filipinos were excluded from their benefits and recognition. To add insult to injury, the promise that they will given citizenship was granted later in 1990, when the immigration reform bill was passed. The worse insult is that they passed the SB 1315 in 2008 without the Filipino veterans and instead now dangle a offer of a lump sum of $ 15,000 with a Quit claim asking themselves to not consider them as American veterans. Without the tacit recognition that they are demanding. 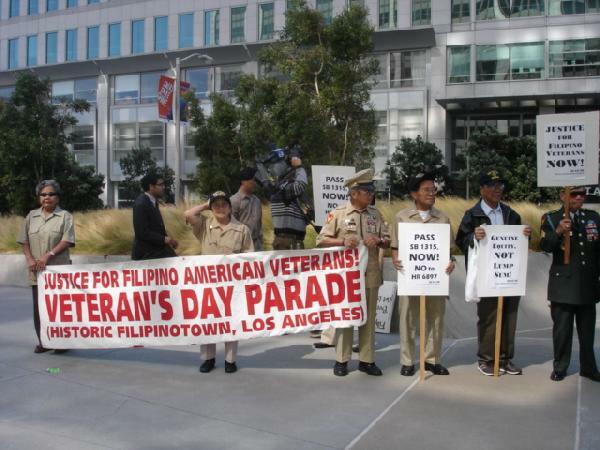 JUSTICE FOR THE FILIPINO AMERICAN VETERANS!